Jupiter is not alone out there. Aside from its 62 moons, the massive gas giant is joined by two clumps of asteroids that orbit around the sun in the same orbit — what are called the Jovian Trojans. Not much is known about these ancient objects, but new data from NASA's Wide-field Infrared Survey Explorer (WISE) is finally starting to provide some answers. The Jovian Trojans consist of two packs, one group that leads the way ahead of Jupiter's orbit, and one that trails behind. Prior to the new observations, NASA scientists were only able to see the groups in a kind of cloudy formation along with a few particularly large objects — but WISE is now allowing them to take a much closer look. What we now know is that the lead pack is larger than the trailing one (a verification of previous surveys). We also know that both the leading and trailing groups consist of predominantly dark, reddish rocks with a matte, non-reflecting surface. NASA now believes that there are at least 1,750 objects in the packs — which was considerably more than they were expecting (about 40% more in the leading cloud alone). This tells the scientists that these rocks aren't foreign to the Jovian system — they've likely been there since the early phases of the solar system's history when the giant planet was forming. And indeed, the rocks do not resemble the asteroids from the main belt between Mars and Jupiter, nor the Kuiper belt rocks located at the icer, outer regions near Pluto. More specifically, they are what are called D-type asteroids — celestial objects that are dark burgundy in color and comprise some of the oldest material known in the solar system. "Jupiter and Saturn are in calm, stable orbits today, but in their past, they rumbled around and disrupted any asteroids that were in orbit with these planets," said WISE scientist Tommy Grav through NASA's official release, "Later, Jupiter re-captured the Trojan asteroids, but we don't know where they came from. Our results suggest they may have been captured locally. If so, that's exciting because it means these asteroids could be made of primordial material from this particular part of the solar system, something we don't know much about." 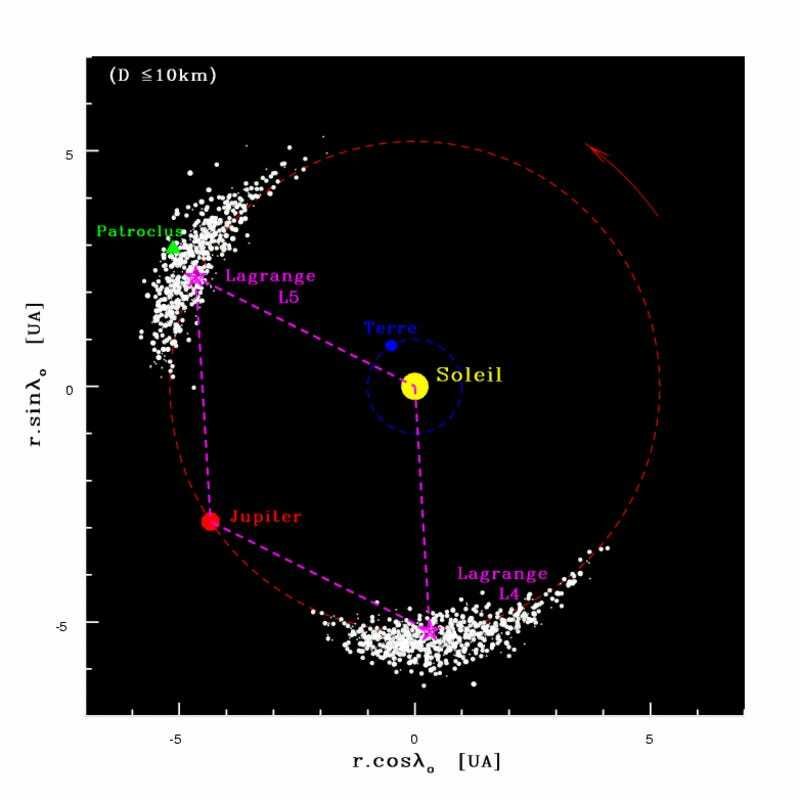 The first Trojan asteroid was discovered by German astronomer Max Wolf in 1906, who confirmed the presence of a 220-mile-wide (350-kilometer-wide) object leading ahead of Jupiter. Named Achilles by Wolf, it would be the first of many asteroids found residing within Jupiter's orbit. Later surveys revealed the trailing pack, after which time they were dubbed the Trojans after the Greek legend. And interestingly, other planets have Trojan asteroids, too. Astronomers have confirmed similar companion objects orbiting along with Mars, Neptune, and even Earth. 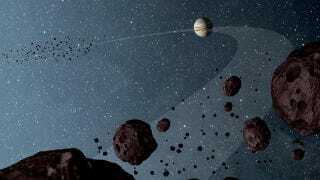 The WISE scientists have proposed that NASA plan for a future space mission to Jupiter to gather the data needed to better determine the asteroids' age and origins. The results were presented on October 15 at the 44th annual meeting of the Division for Planetary Sciences of the American Astronomical Society in Reno, Nev. Two studies detailing this research were accepted for publication in the Astrophysical Journal. Top image via NASA/WISE. Inset image via obspm.fr.